I tend to have oily skin, and living in NYC during the warmer months, things can get ugly. 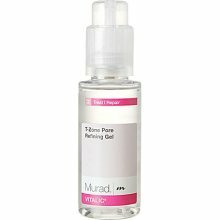 Murad T-Zone Pore Refining Gel is supposed to help clear skin, reduce shine and reduce pores by using ingredients such as glycolic / salicylic acid and pomegranate extract. After using Murad T-Zone Pore Refining Gel for a full two weeks, I feel I’m ready to review it. The Application: Murad T-Zone Pore Refining Gel is a clear, sticky gel that is supposed to be used around the T Zone or anywhere on your face where there is excessive oil. So after washing my face in the morning, I took a pea sized amount of the gel and rubbed into my skin. The gel did go on smoothly, but I noticed immediately that it was very sticky and didn’t have the most pleasant smell I have ever encountered. I could definitely detect the pomegranate mixed with something I couldn’t quite place which may have been better. It really was unpleasant. The Results: After two weeks, I didn’t notice a change in my complexion, pore size or oil production. In fact, my face was just as oily as it usually is by midday. The only thing that changed was the uncomfortable feeling of having a thick layer of sticky goo gel on my face. Not pleasant at all. My make up was not affected by this invisible sticky barrier, but it didn’t matter as I was definitely aware of the gel barrier for a good hour or so. The Verdict: Usually I like to try products longer than just two weeks to let the product live up to its full potential, but I couldn’t bring myself to wear Murad T-Zone Pore Refining Gel any longer. The gel was too sticky and felt strange on my face. Also, the smell was just bad. Would I try this again? Nope, in fact I will be giving the rest of the bottle to a friend. I hope our friendship lasts after she tries it.